Fukushima contamination mutating vegetables and fruit? Is Fukushima fallout causing mutations in fruit and vegetables? It is still unknown how the Fukushima Dai-ichi Nuclear Power Plant disaster in 2011 will affect the ecosystem in Japan, because no one – not Tepco, nor government authorities actually know how much radiation was released into the air and in the ocean, following the damage to the reactors. Tens of thousands of people were forced from their homes by the threat of radiation, but some experts report that the reactors pose little or no danger (steam was reported coming out of reactor 3 today) to humans. At the moment no one has yet died from radiation exposure– and long term risks and increases in cancer are being deemed to very small and some think that there will be no increase in birth defects or genetic abnormalities from contamination. However, from previous enviromental disasters, we know that tracking increases in cancer and abnormalities in the population, will have to be done over a very long period of time in order to have a clearer picture on the effects of fallout on health . Last year we heard of the study headed by Jogi M Otaki of Ryukyu University in Japan on the increase on the mutations found on butterflies at Fukushima. 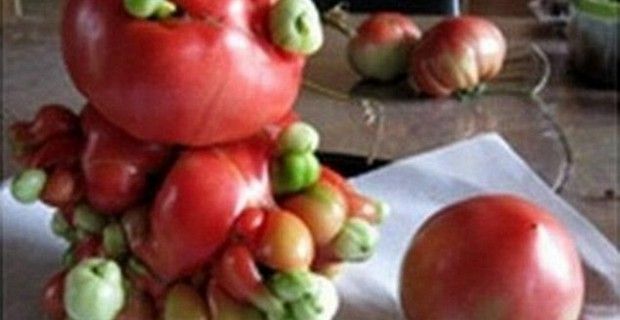 The other day a batch of photos of 'mutant' fruits, vegetables and flowers were posted on Imgur, but several of these images had already been posted on the Fukushima Diary website last year, so they are not new, but still very disturbing. There are pictures of a five fingered turnip, a giant tomato with deformities, bumps and lumps, peaches fused together, and numerous fruits coming from a single stem and other odd and scary looking mutations. There’s also a huge cabbage which is said to be mutant, which no doubt is is, but anyone who has been to a fair or a garden show has seen extremely huge vegetables and fruits win first prizes. There have been and 18 pound onion and the world’s longest parsnip that measures 18.5ft, which obviously didn't come from Fukushima. To say that all these mutations are caused by radiation contamination from the Fukushima can be a stretch, because natural radiation, as well as many other chemical substances in the environment and other factors, can also cause mutations. So do you think that these fruit and vegetables are the result of radiation from Fukushima? Fukushima: more contaminated water leaking into the Ocean? Fukushima butterflies: Mutation after Radiation?